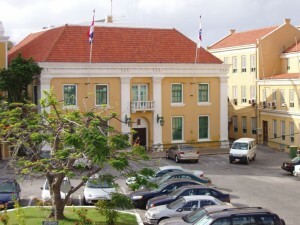 WILLEMSTAD – There seems to be no bankruptcy of financial crisis in Curaçao. Interim Prime Minister of Curaçao, Gilmar Pisas said, about two weeks ago, during a press conference that the island was financially bankrupt. But according to the Committee for Financial Supervision (CFT) this is not the case. Pisas kept repeating that the island was at the border of a financial abyss. During the press conference of the Council of Ministers, the Interim Premier spoke about a very painful condition and he described the financial situation as bankrupt. Earlier the Interim Minister of Finance, Lourdes Alberto also expressed her concern about the deterioration in the public finances. Remarkably, her predecessors, Kenneth Gijsbertha and Dr. Jose Jardim in no way said that the island was in a financial debacle. The most recent report of the CFT from March 15 of this years, does not indicate that what both the Prime Minister and the Minister of Finance are saying are true. There are also no other documents to support these claims.